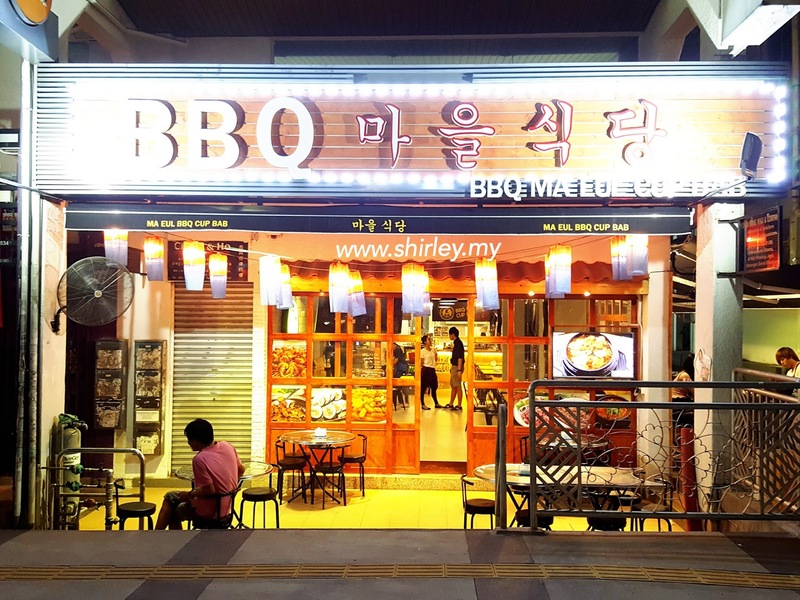 Good news for bbq lovers, there is a new Korean BBQ opened at Damansara Uptown which can be one of your selection on your next craving time. 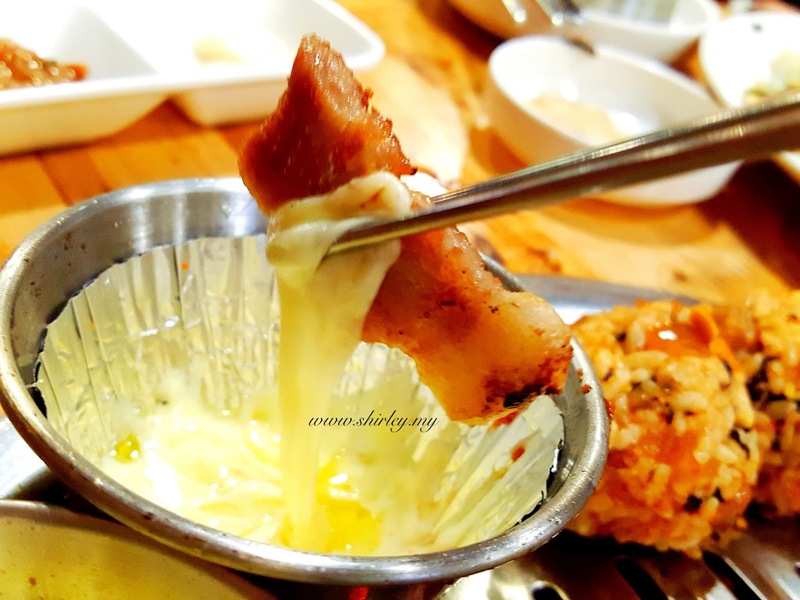 It is very easy to find, the location of BBQ Ma Eul Cup Bab is right next to Baskin Robin. How if you love to eat bbq but you don't like to cook? No worry, the staff will cook for you. 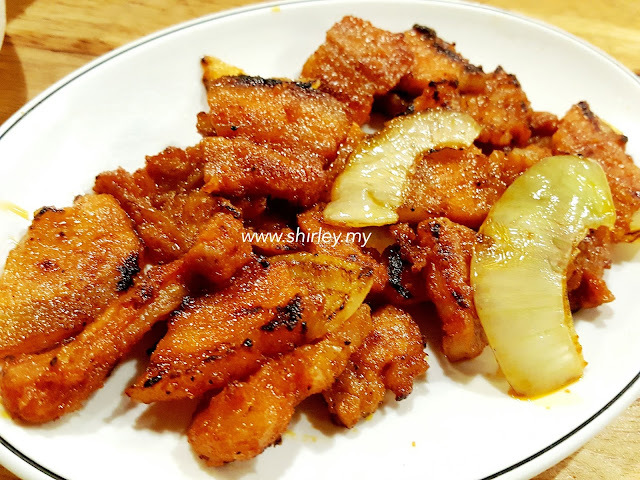 How if you like to eat but don't wish to cook on your table? No worry, there is another service provided by the shop whereby they will cook it for you at outside. 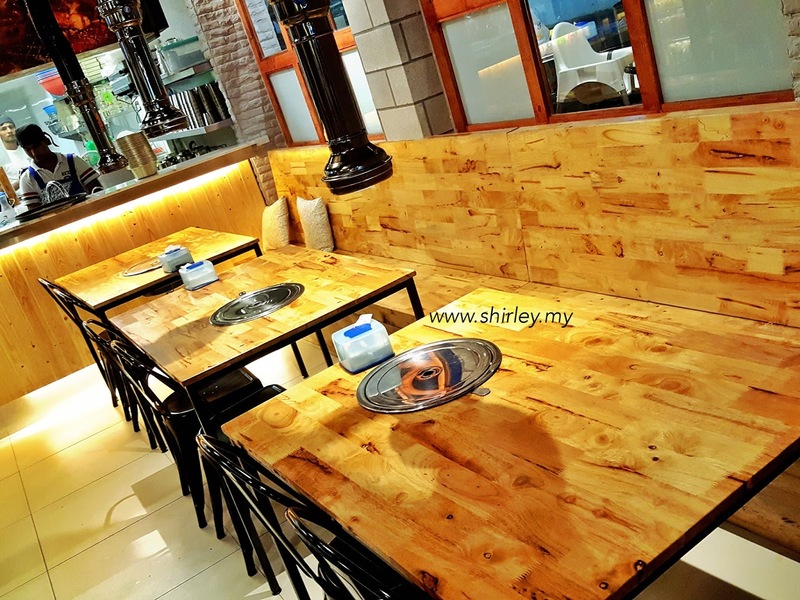 In a meanwhile, you can actually eat on a clean table without having bbq smoke coming out from the bbq hot plate on your table. 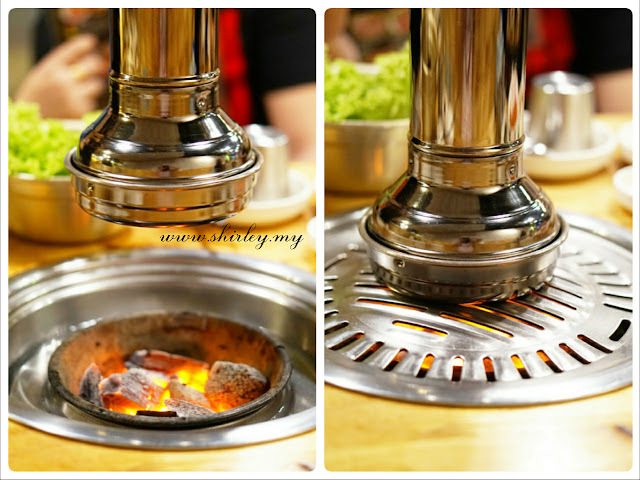 So far, this is the only korean bbq restaurant in KL who provides this kind of service to customers. Most of the korean bbq restaurants normally help customers to cook on their own table. So if you are looking for some kind of service like this, you may visit here. The meat are all fresh and well-presented. The pork neck meat is so thick! WOW! I guess that I'm going to gain more fat after this. 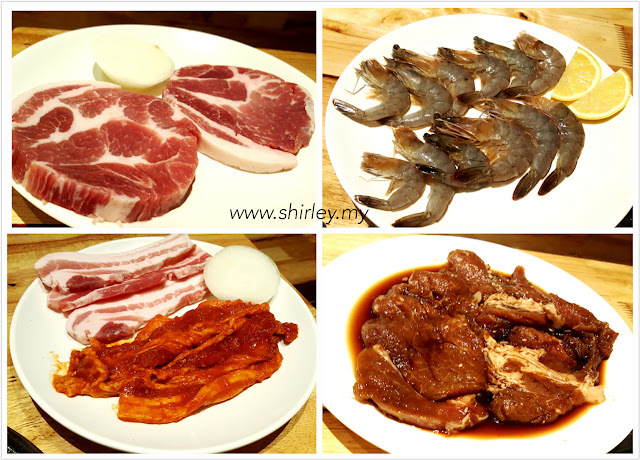 Set 1 (RM59.00): sliced pork belly, pork shoulder, grilled chicken or spicy rice balls. 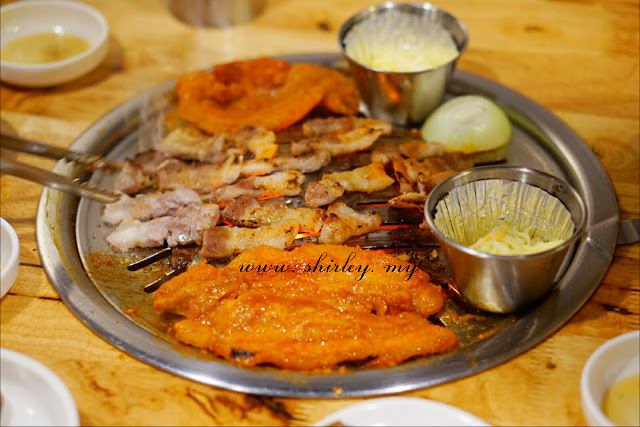 Set 2 (RM79): sliced pork belly, pork ribs marinated in soy sauce, spicy grilled pork belly, kimchi stew. *both are suitable for 2-3 persons. Well, our meat are now on cooking. Normally the staff will cook for you on your table unless you want to cook on your own, you may request the staff not to help you up on cooking. There are two ways to eat the bbq meat. 1 - wrap the meat with vegetables and eat. 2 - dip the meat with melted cheese and eat. 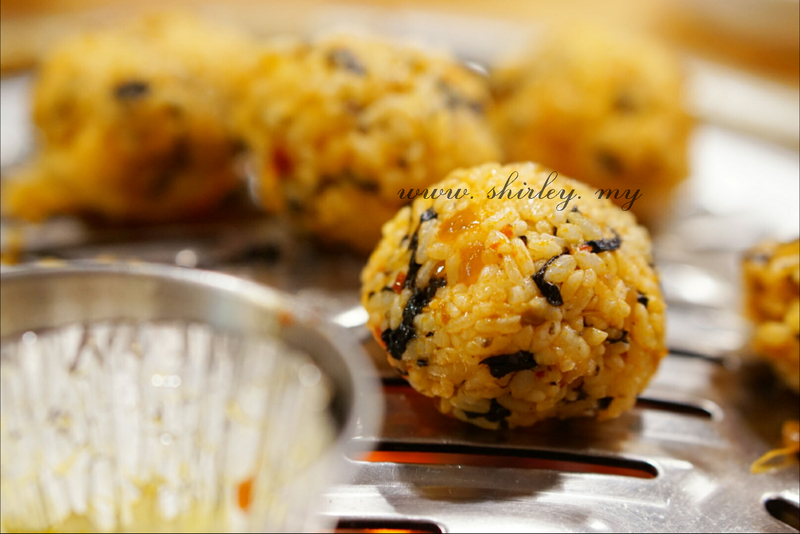 In Korea, rice ball is called as jumeokbap. Jumeok literally means 'fist' and bap means 'cooked rice'. You must be wondering where the rice ball is upon serving. 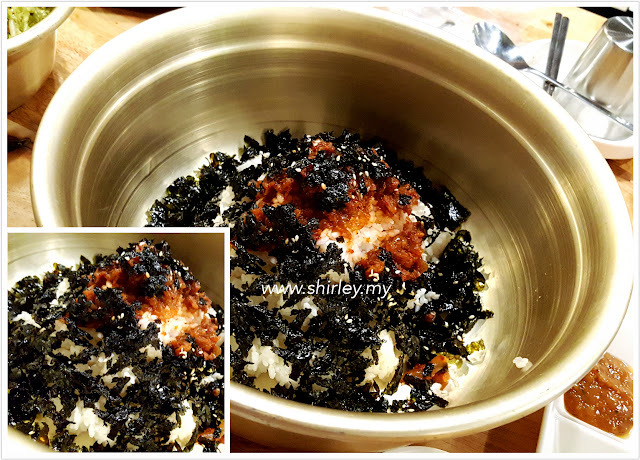 Spicy rice ball is a combination dish of steamed rice, spicy sauce and seaweed flakes which serves in a korean big bowl at the beginning. A pair of transparent sleeves is prepared for you. What are you going to do with the sleeves? Yeah! 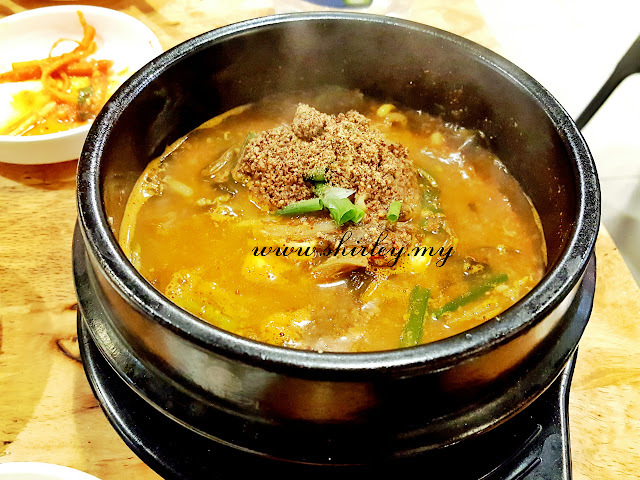 The best part of enjoying this dish is to get your hands rolling in the bowl.You might not want to do this and eat alone, get some friends to come together so you can definitely order this dish to play around! Roll the rice into any shapes you like and place it on the hot plate to heat on. You can eat it after heating for some time. The rice ball has crust on its surface due to heating, thus it tastes bit crunchy and nice. That's the best part of the rice ball, so please leave it to heat on for a little bit longer in order to taste the crunchy part. 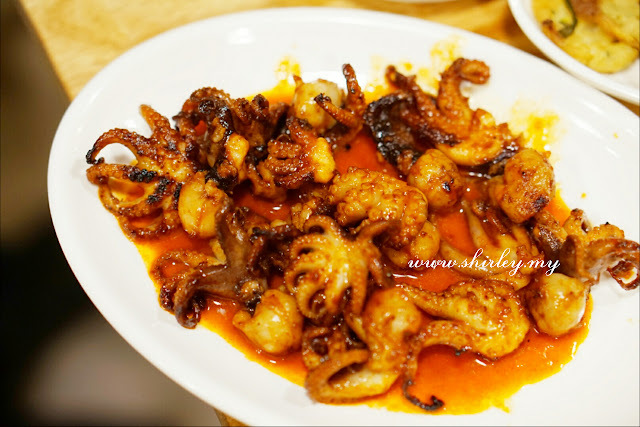 Normally we see baby octopus dish at Japanese restaurant which they serve it in raw condition. 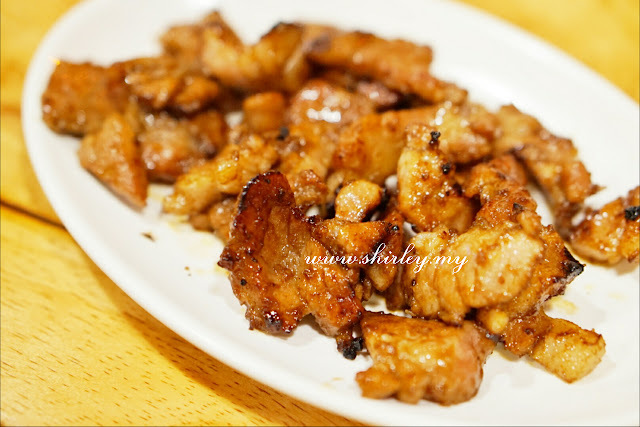 However, BBQ Ma Eul Cup Bab serves this in grill way. The grilled baby octopus tastes so good for me. 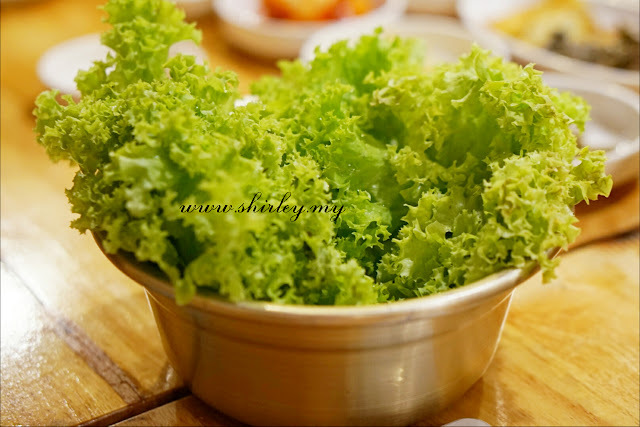 I believe everyone who love Korean food would definitely love their side dishes. 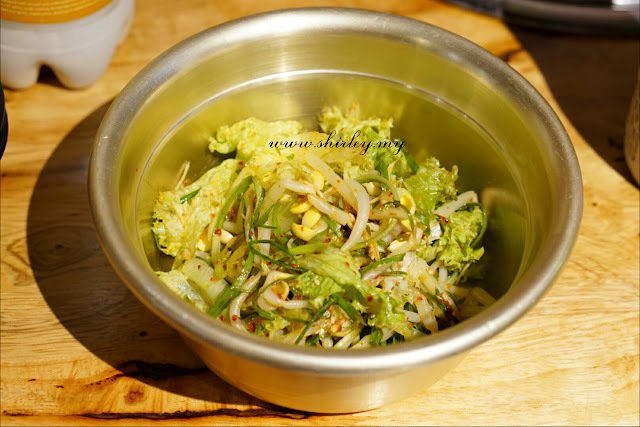 Basically, there are slightly difference side dishes will be served everyday. 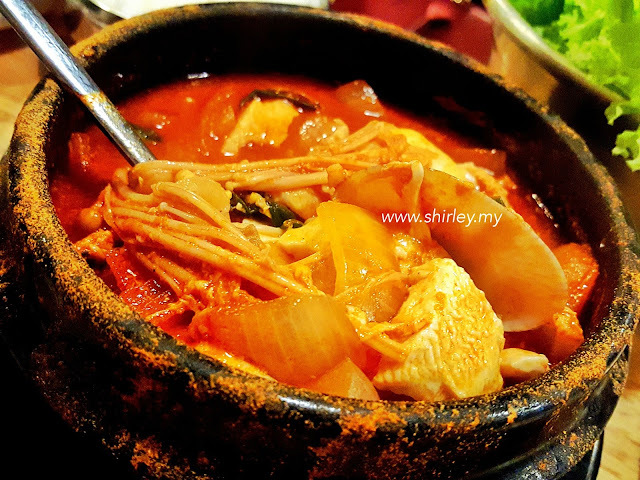 I love their kimchi very much as it comes with the original Korea kimchi taste. The authentication of kimchi is always what I am caring for. Sometimes I might get fake kimchi (which is not originally made from Korea) which does not really taste as good as the original one. 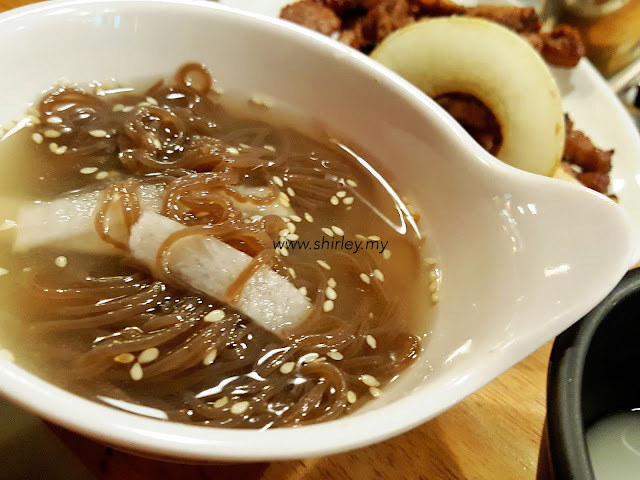 Korean icy cold noodles is called as Naengmyeon(냉면) in Korea. It is the best to eat during hot weather like Malaysia. 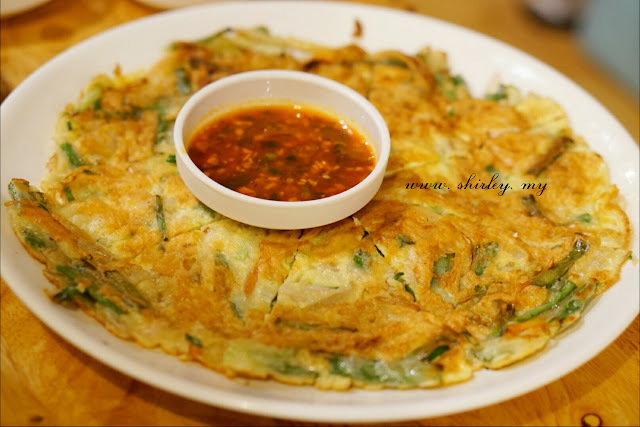 But in Korea, people love to consume this even though it is very cold out there. I can really feel that my body cools right down after I slurp the cold noodles and drink the cold broth. 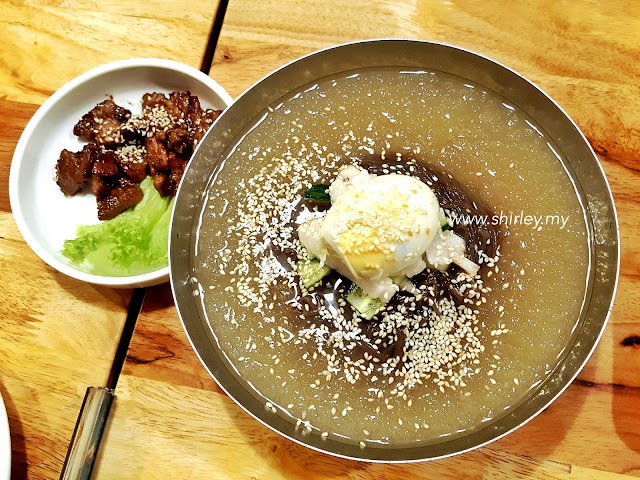 The cold broth is savory and little bit sweet, the noodles itself are soft and chewy. There are four various type of cocktail soju available in the shop, blueberry, pomegranate, citron, and grapefruit. Always see soju in Korean Drama but never try before? Come here to try out their new beverage of cocktail soju! Makgeolli is a kind of Korean rice wine which is made from grains such as sweet rice, regular rice, barley, wheat and malt. It comes to be milky and sweetness. 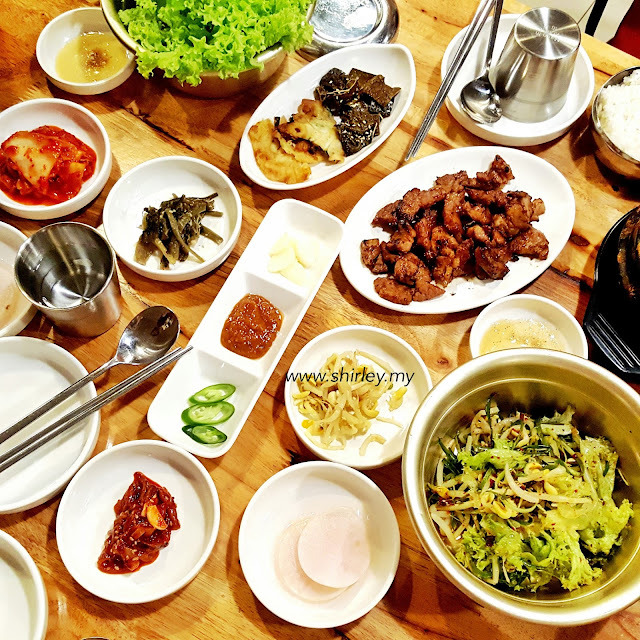 Makgeolli is considered as the oldest alcoholic beverage in Korea, thus you might rarely see Makgeolli in other Korean restaurants. The moment I bring it into my mouth and swallow it, my stomach feels warm right away. That's super cool especially you are feeling cold at that moment. 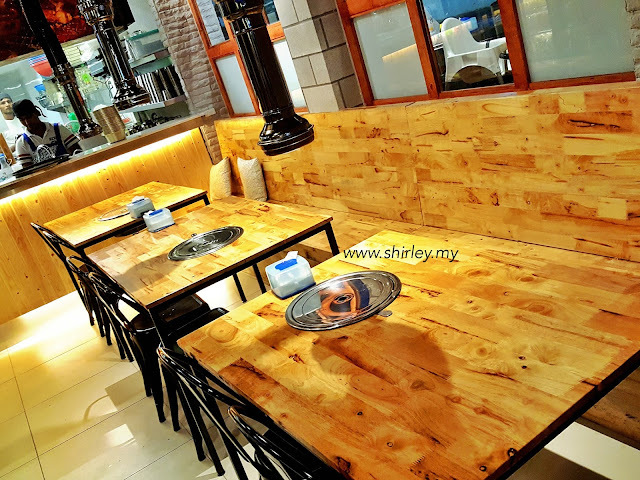 The interior design of the restaurant is what I am in love with especially the outdoor tables. 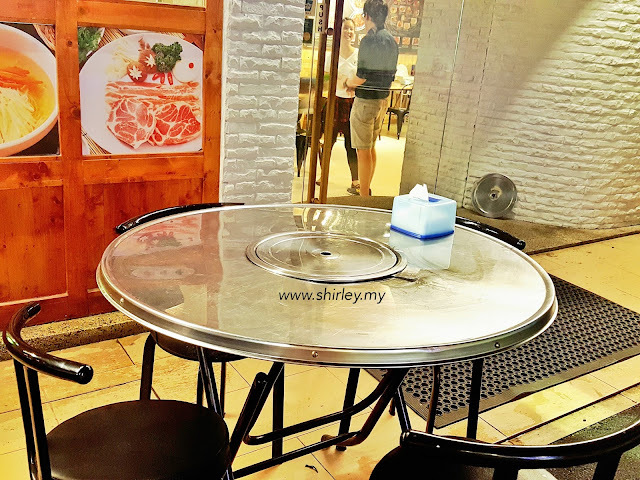 I always see people chilling on this table in Korean drama and now I see it real in BBQ Ma Eul Cup Bab! The outdoor of the restaurant is actually quite similar to the street food stall in Korea which you can often see it in the drama. That's pretty cool right!